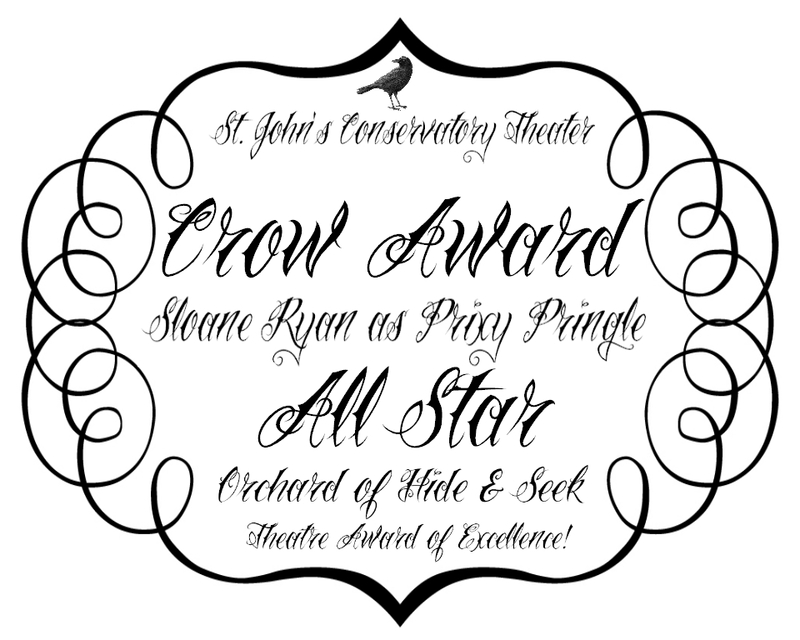 To celebrate excellence in theater, St. John’s Conservatory Theater (JCT) awarded, on July 28th, the cast of their hit musical ORCHARD OF HIDE & SEEK with over a dozen coveted CROW AWARDS! The Crow Award, so named after the crow or raven for their regional habitat, lifelong partnering, and yes, acting ability, is awarded to members of the company under 18 years of age. Ultimately, the award ceremony will be a single event held yearly. It will include actors, musicians, dancers, artists, and technical staff of any age that have participated in one or all five of that years’ seasonal offerings. This year’s recipients included Local talent from Ogdensburg, Huevelton, and Canton that were rewarded for outstanding achievement in portraying their roles such as Myah Myers as Battyboo (Going Broadway Award), Hailey Weber as Stargleam (Going Broadway & All Star Awards), Emily Gardner as Raindew (Promising Newcomer), Meghan Gardner as Heartglow (Promising Newcomer Award), Sloane Ryan as Prixy Pringle (All Star and Going Broadway Awards), Madalyn Bascom as Trixy Tringle (Promising Newcomer Award), Caitlin Kelly as Ariah Ropidy (Promising Newcomer Award), Payten Walsh as Opidy Dobity (Promising Newcomer Award), and Grace Wills as Zopidy Yopity (Promising Newcomer and Going Broadway Awards). Other awards received that evening were the Super Star Award in Musical Arrangements presented to Ryan C. McNally for his work on ORCHARD OF HIDE & SEEK and the Tongue-N-Cheek Award to Madalyn Bascom as Trixy Tringle.